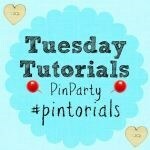 A huge welcome to Week 43 of the Tuesday Tutorials Pintorials Pin Party! It’s Thanksgiving week in the US which means that Christmas and the new year is just around the corner! How time flies, this year has gone so quickly! This week I am featuring Christmas tree crafts! First up is this beautiful pipe cleaner Christmas tree from Zing Zing Tree. Next is from There and Back again a Mother’s Tale who painted this beautiful egg carton Christmas tree. Lastly is Wild Berry Trail who made this beautiful tree made by felt! I love it! Now, I fancy making Christmas tree cookies next week! Do look out for my post! Don’t forget to pop by to take a look at Kate (Christmas Sensory Bins), Anna and Hodge’s (handmade Christmas ideas) blogs to see who is featured this week.